This is of course only an introduction, so let me go ahead to fill in the blanks and expand on the backstory of both the man, the nation he founded, and how they connect with current events. Originally, Sansha Kuvakei appeared on the public stage as a charismatic visionary who promised to create a society without economic scarcity or the need for money. Intellectuals and innovators of all kinds were to be given the freedom to fully realize their potential. Starting from a number of solar systems he had acquired by spending his considerable wealth, his new nation expanded quickly as colonisers from all over New Eden joined and settled more worlds. Secretly however, Kuvakei made further plans with the dispassionate reasoning of a megalomaniac technocrat. The basic premise of his society was that all previous forms of human organisation are flawed because they did nothing to improve humanity itself. According to Kuvakei’s ideals individuals of lower physical or mental aptitude had to be “enhanced” cybernetically to make them stronger and smarter. He based his improvements on the then recently introduced Jovian capsule technology and experimental neural augmentation science. Incidentally his implants would also strip away the subject’s free will and humanity, turning them into completely obedient slaves who were specialized to fulfill assigned tasks. To test his developments, Sansha Kuvakei used Minmatar slaves acquired from the Amarr who thought he would provide them with effective mind-control technology which they could use on their own slaves in return. Kuvakei’s purpose was not to serve Amarr interests though. The True Slaves his method created were destined to be the labourers and soldiers of Sansha’s Nation, linked into a hive-mind and under the control of himself and the intellectual elite of his utopia, the True Citizens. The latter also received neural augmentations, but they were allowed to retain their individuality and were “only” conditioned to not oppose Sansha Kuvakei himself. When the CONCORD-led forces moved against Kuvakei and his remaining loyalists, they discovered that liberation efforts were futile. Sansha’s army of True Slaves was programmed to fanatically defend the Nation with complete disregard for their own lives. During the terrible war of attrition which followed, several of Sansha Kuvakei’s inner circle True Citizens managed to extract themselves together with a number of slave-crewed ships under their control. Kuvakei himself, however, apparently died in the final confrontation. Gallente forensic experts found remains that matched his DNA. With the Nation shattered, its remaining forces driven into uncharted space and their leader declared dead, the coalition called it a decisive victory and withdrew. They would be proven wrong several decades later. The ascendency of the Capsuleers in YC105 lead to a renewed interest in Sansha’s Nation. The pod pilots found that slave implant technology recovered in the aftermath of the Nation’s destruction was highly effective in augmenting their ability to operate ships. Sansha ship designs also provided interesting instruments of warfare. Capsuleer explorers thus went on expeditions to find more of the Nation’s lost secrets and they did. 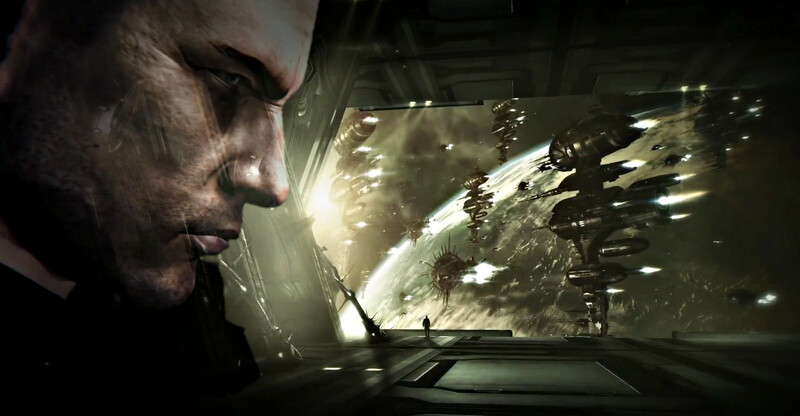 The capsuleer alliance Ascendant Frontier had settled in the cluster’s south-eastern regions and allied themselves with the notorious Angel Cartel. Together they discovered a forward operations base at the border with Stain from which True Citizen Frazier Eachann lead raids into Angel Cartel territory. They engaged the Sansha forces and despite heavy losses remained victorious. More importantly, the hiding place of the reconsolidated Nation forces was discovered. It turned out that they had spent the last decades settling territory in Stain and replenishing their numbers with newly created True Slaves and a large number of ships. Initially they appeared leaderless. True Slave piloted vessels encountered appeared to only execute old command routines, until one day a representative calling himself Sansha’s Speaker issued a public statement to the Angel Cartel warning them against further incursions into Stain. Furthermore, speculation arose whether Sansha’s Nation might have attracted capsuleers into their ranks. Still, for years a detente endured which saw only sporadic skirmishes between Sansha fleets and small groups of pod-pilot explorers. That turned out to be nothing but the silence before the storm. In the early weeks of YC112 (i.e. 2010), Sansha Nation forces launched coordinated attacks against a number of systems all over the central cluster without warning. Those assaults were unsettling in nature and purpose. Everything but leaderless, the Sansha forces were commanded by True Citizens supported by capsuleer sympathizers. Their fluid-router hivemind appeared to be fully functional and they had radically improved the combat capabilities of their ships, including a previously unknown supercarrier-class vessel. Using methods that defy explanation, they entered their target systems through artificially created wormholes and caused system-wide disruptions of defenses and communication. Their goal was not military victory against the hurriedly scrambled capsuleer militias and faction navies, but to abduct inhabitants of settled planets. During their first attack, they successfully took roughly 200.000 citizens from different worlds. As the Incursions continued the fate of those abductees became terribly obvious: converted into True Slaves they were used to crew and pilot even more ships in the Sansha fleets. Contrary to the last major confrontation with the Nation, the four empires failed to form a unified response. 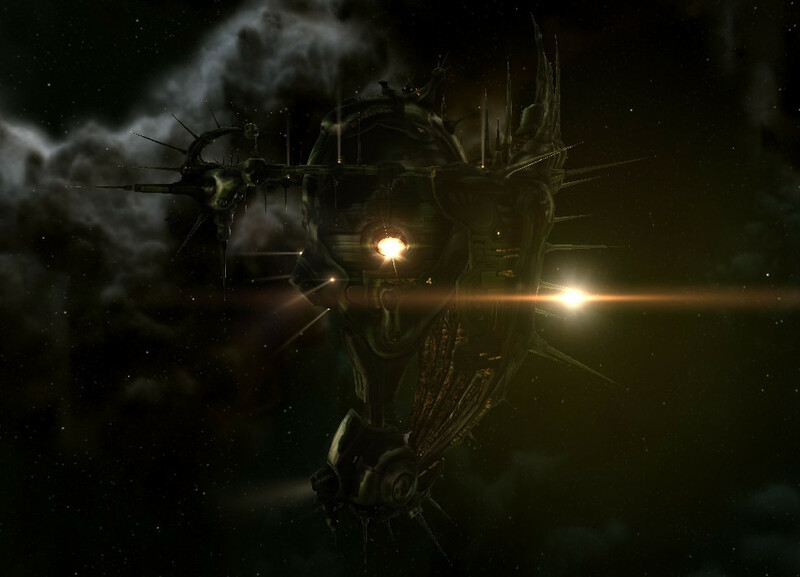 CONCORD consequently stepped in and offered rewards to capsuleers who would repel Sansha incursions, but they were not the only ones trying to rally capsuleer support. A man who called himself Master Kuvakei and perfectly matched the appearance of Sansha himself called out for capsuleers to join him. That broadcast caused a wave of speculation. Nation sympathisers rejoiced and declared their allegiance but many asked themselves how Kuvakei could possibly have returned so many decades after being declared dead. Cloning technology would of course make that possible, but there were doubts whether Sansha Kuvakei even had a clone, and if so, why would he wait so long to reveal himself. Still, one anonymous CONCORD official warned against doubting that Sansha Kuvakei is not really who he claims to be, and there was indication that CONCORD knew more than they would let on. The leaders of Synenose Accord – a capsuleer militia formed to fight the Nation threat – publicized evidence that CONCORD had been aware of a military buildup within Stain, and for reasons unknown kept that knowledge from everyone else. There was even evidence that Nation agents had infiltrated CONCORD. The compounding mysteries got yet another twist when a capsuleer managed to collect visual data from the other side of a wormhole opened by a Nation fleet. The implications of that discovery were staggering. To everyone’s shock and surprise, Nation forces had succeeded in taking control of at least one station in Jove space. By doing so they might have acquired technology far beyond anything other powers of New Eden possess. That would be a possible explanation for the advanced weaponry, electronic warfare and wormhole generators the Nation fleets deploy in battle. The connection between Jovians, Sleepers, Talocan and wormhole-travel has been discussed earlier, and as of YC112 Sansha’s Nation has become another factor in this mysterious interrelation. 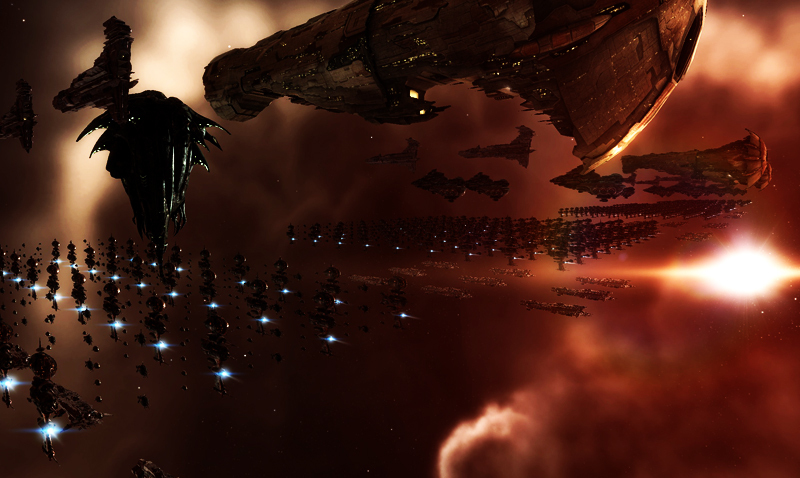 Recent reports from explorers now also show that Nation forces are active in Thera and other shattered wormhole systems which further supports speculation that they are involved in current events related to the opening of new wormhole connections. It is still an open question whether the current Sansha Kuvakei is actually who he claims to be, but his behaviour and mindset has not changed from 70 years ago. The capabilities and methods of his forces have changed radically though. In addition to their advanced military technology Sansha’s Nation also found a way to turn people into slaves within minutes by using nanotechnology, as is evident from this chilling interview with the man who appears to be Sansha Kuvakei. Only very recently a small consolation came when CONCORD reported that Nation forces evacuated a constellation in Oasa which had been under their control. Uncharacteristically, they did not use wormholes to extract themselves and that may indicate that they at least temporarily lost the ability to create them. To conclude I would offer one speculation to ponder: If a pure infomorph like The Other could subvert the transfer of Jamyl Sarum’s mind from one clone to another, what would it be able to do with an implant-based fluid-router hive mind like Sansha’s Nation? Special thanks for inspiring and helping with this piece go to: Julianus Soter, Rhavas and all the contributors of Aurora Arcology and SYNEPublic.